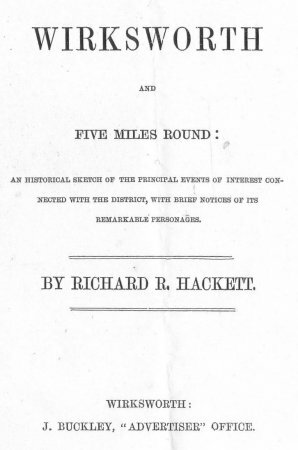 An attempt to discover some of the early history of R.R.Hackett, author of "Wirksworth and five miles round", published in 1863. The webmaster has a copy of the second edition, printed by: Frank W Brooks, 27 North End, Wirksworth in 1899. Also see John Dobson's HACKETT Genealogy page. "This Large Paper Edition is limited to 75 copies"
Tokens declined, and they were ultimately suppressed. with these Wirksworth had no connection at all. been a regular attender at their monthly classical meetings. temporal necessities of the poor. as did not clash with the authority of the higher courts." the "Classicall fast", but sometimes as the "monthly lecture." the Commonwealth, and then conformed to Presbyterianism. eloquent address on his ejection from carsington in 1662.
have been a very prominent member. but only held it for two years. buried in the Church of Wirksworth. the Sabbath Day, and preaching twice with great acceptance. arch of parting between smooth locks of pale reddish hair. could help melting away before their glance." sought Thee; her mind was dark; her life was unholy. known to Mrs Elizabeth Fry, who stimulated her labours. their christian activities were continued in many directions. to the work of the gospel, that Methodism is peculiar for. found at Wirksworth, represents the Temptation of Eve. figure remains - the rest has been cut away. other than incident to old age." represented with Nonconformist Churches than is Wirksworth. of the best sites in the town. It was rebuilt in 1885.
was carried in barrels strapped to the back of a donkey. Vicarage wall, which is still extant in a few cases. Yard in the North End, now known as Torr's Yard. be seen an old sun dial. of the proposed Town Hall. difficulty to adapt it to meet the various requirements. at which there is also a reading and Billiard Room. handles being covered with silk velvet. The Band of the Wirksworth Rifle Volunteers. Directors and other Officials of the Midland Railway. Committee, Clergy, Gentry, and Contractors. A light truck, on which was placed the Wheelbarrow and Spade. number) with models of their working implements. The Wirksworth Drum and Fife Band. Friendly Societies, and a portion of the Middleton Clubs. very formidable and imposing sight. then emptied its contents amidst enthusiastic cheers. Nottingham. Gingham weaving was also largely carried on. Primitive Methodists have a Chapel here. Farm, whilst residing with Mrs Job Walker. old cellaring may be seen. during six days of the week, and one on Sundays. the past has been rich in historical associations. applied to a Scholarship (to be called "The William Ogden"
the derby Grammar School, or other public school. 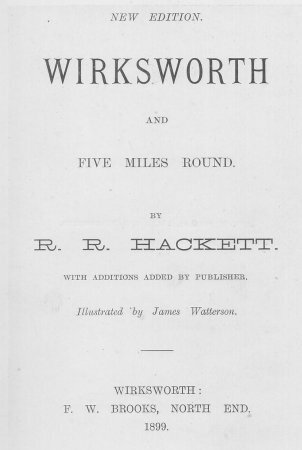 the parish of Wirksworth as his trustees should select. Mrs Strange £25, Mrs A Wright £50, C Arkwright, Esq. H Ogden £279, Mr C Seeds £500, Mr T Doxey £106. Note A. Bolehill, Wirksworth. Page 22.
however, which he found, was the bottom rim of the refining pot. it would become what is called "pigs of lead". Note B. Description of Chimney-piece. Page 49.
seems certainly intended for Corinthian. the central ornament is formed of three trefoils." and from Ron Hackett ["svh1946-rhgn AT yahoo.co.uk"]. 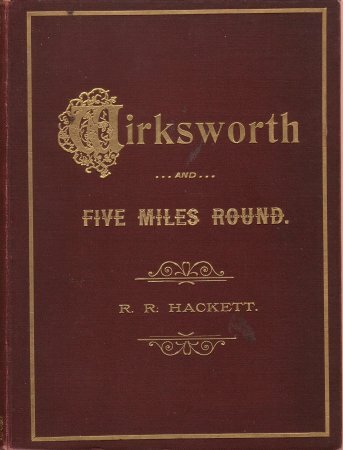 "Wirksworth and five miles round"
published in 1863 when he was 34 years old. published in 1899 when he was 22 years old. These subscribers are for the 1863 1st edition. Subscribers located in the Census are linked. 32 from Wirksworth, 20 from other parts of study area. daughter of Samuel and Mary Flint nee Killer  my Gr Gr Grandparents..
She was the daughter of Thomas and Mary Brace nee Shore  of Bonsall ..
of William and Mary Brace nee Gell of Cromford. Jasper Wager Gent of Great Longstone took over the Post Office..
of Wirksworth..Stephens fore bares were both my wife's and my kin..
and built by Richard Arkwright 2nd  son of Sir Richard Arkwright..
Arkwright's friend was William Shore Head Master at the school..
known as Martin, Hall & Co with showrooms in Glasgow and  London..
children then born emigrated as Latter Day Saints to Kaysville Utah U.S.A.
many churches both at Sheffield and at Middleton his home village..
Sheffield in the 1970s his Circuit Steward being Micheal Wragg..
Smedley of Steeplegrange at a Hosiery Workshop on North End Wirksworth ..
natural daughter of Sarah Wigley married John Sheldon of Slaley of my kin..
Lea Bridge  who married Anne Ogden dau of William Ogden of Tansley..
at Darley Bridge until Wass bought in new pumping engines at Mill Close..
family who took over most of the working lead mines from the 1840s-1900. Ian Coates Butchers shop was, now an outlet for  specialist cheeses..
Robert Wildgoose  1822 - 1900 was son of John and Fanny Wildgoose ..
High Peak Railway at High Peak Junction Workshops.. When Amos obt..
Stonemason / Building Contractor  he also mentioned in Hacketts book. Budworth, Mrs, "Hope and Anchor"
I believe is a distant kin of my wife's family of Slack/Swinscoe kin..
Gr Grandmother Mary Slack who married Joseph Evans of Middleton..
Benyon of this family courted my mother for a time. Timothy Jepson a Railway Manager..
one of his sons married into the Fritchley family of Wirksworth..
William John Harrison named was a Joiner/Builder at Steeplegrange..
for him as did my Grandfather  John Walker on nights 10.00 p.m to 2.00 a.m.
married 3 times  my Grandfather's mother Martha Sheldon  his 3rd wife..
the bakery to make ends meet. up to recent years was an Apprentice to Luke Hall..
with the family firm and a Methodist Local Preacher..
Place Wirksworth  He was the son of John and Martha Land nee Greenhough.. Grandfather was George Land who married Anne Brookes of Bolehill..
married John Walker  they my Grandparents..
Walker nee Higton of Bolehill. James a Master Stonemason / Builder..
which continued as a Grocery Shop up to the 1950s still in Hall ownership..
twilight years...his heirs still live in the Wirksworth area today..
of my father both being Councillors on Wirksworth UDC and fellow Rotarians..
Arthur Edward Chamberlain son of Frederick John Chamberlain of Worksop.. The Midland line..Peter Jepson  also named on Hacketts listings..
Clarke at West Derby, Liverpool in early 1871.
also proprietor of the Cheshire Cheese Public House at North end. the Past web site shows that he was still operating at that time. of my kin 1870 son of William and Lydia Walker nee Hall of Bolehill..
James Watterson jnr. was son  of George and Fanny Watterson..
it in his web page. below and the death certificates. found some copies of the "Wirksworth Advertiser and Matlock Advertiser"
1867 when copies were being sold for 2s 6d (at that time about 50 cents US). 1864 that the sale had been cancelled by mutual consent. I will contact you again when I have the further information I am gathering. Christmas. I'll give you both credit for reporting the discovery. able to obtain a copy. same URL indefinitely, and you are most welcome to quote from it. at Wirksworth, afterwards rmoving to Manchester. widow, a son and three daughters. and Newspaper Prop. R.R. Hackett was Josephs Apprentice I believe..
built by Sheldons next to where the Brookes and Buckley family once lived..
married Anne they living at Bolehill on marriage .